This copycat Panda Express SweetFire chicken dish is the best take on the classic sweet-n-sour chicken I’ve ever had. The flavors are just spot on, from the sweetness of the pineapple to the kick from red pepper flakes, to the crunch of onions and crispy chicken. I’d make this again. And again. I confess that I made a big ole mess in the kitchen when I made this chicken. Apparently, I was cornstarch-dredging challenged that night, because I had cornstarch all over the place. It was well worth it, though. Also try my Firecracker chicken and my spicy orange chicken. Place chicken pieces in a large resealable baggie or container and add the flour along with salt and pepper to taste. Seal and shake to coat. Place 1 cup of the cornstarch into another shallow bowl. Working in batches, remove chicken pieces from the baggie and shake off the excess flour. Dip into egg and coat, shaking off excess. Next, dip into cornstarch and coat, shaking off the excess. Fry until golden and crispy on all sides. Remove to a paper towel-lined plate. Finish cooking remaining chicken. Combine the 4 tablespoons of water and remaining 3 tablespoons of cornstarch in a cup or glass. In a small pan, combine the red pepper flakes, garlic, sugar, and vinegar. Bring to a boil then reduce the heat. Whisk in the cornstarch mixture and keep warm. Add a little more oil to the skillet or wok and add the bell pepper and onion and cook for 3 minutes. Add the pineapple and cook another minute. Add the sauce mixture in and stir. Add the cooked chicken and gently stir to coat and combine. Serve over rice or noodles, if desired, and garnished with green onions. 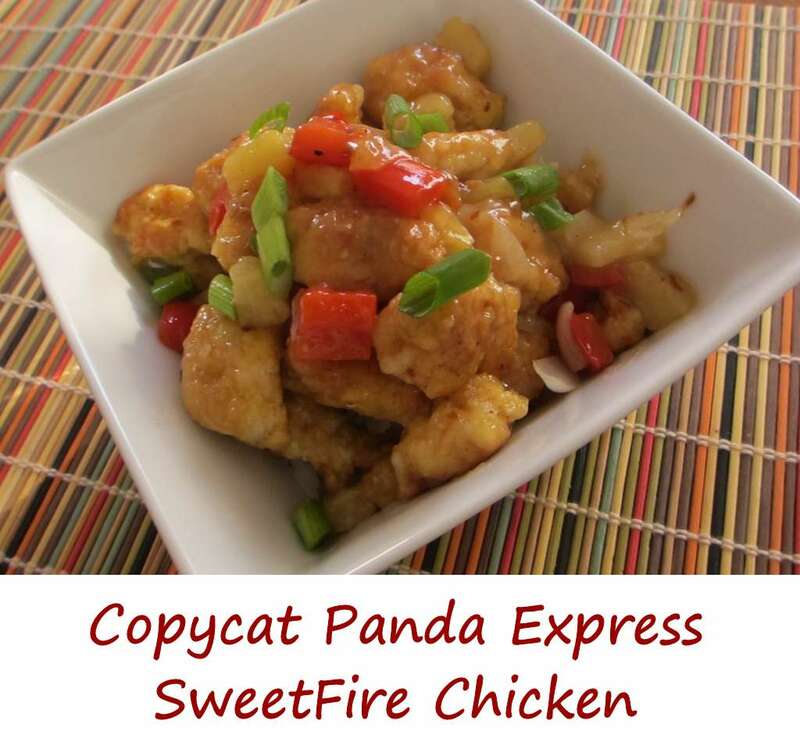 This entry was posted in Copycat Recipes, Main Dishes and tagged chicken, copycat, Copycat Panda Express Sweet Fire Chicken, Copycat Panda Express SweetFire Chicken, panda express, Panda Express SweetFire Chicken, recipe, sweet and sour, sweetfire by Mike. Bookmark the permalink.